So…What Do You Eat When You Travel? I have been asked that question numerous times over the past few years, and at least 3 times this past week. 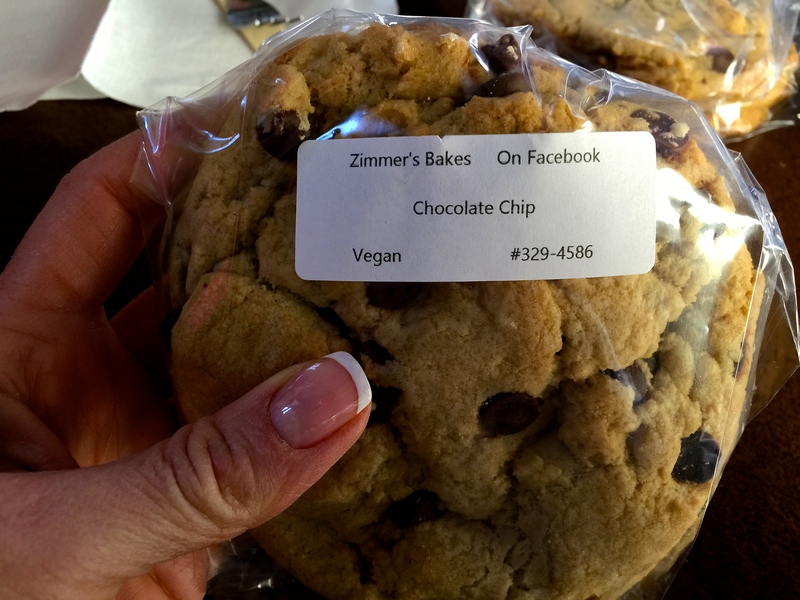 And while it’s not always easy, it is always possible to eat vegan on the road. Plus, we’ve discovered some awesome restaurants along the way. What a great idea for a post! Or at least I think it’s a great idea. You may think differently, but I’m going with it. Because #1, I’m traveling. And #2, turns out it’s a great way to kill some time in the car. AND, #3 it allows me to procrastinate (I’ll just take a little “break” from working on my teacher effectiveness plan…it’s not due until May 1st, anyway). So, as we travel out east to visit our two girls, and do a little spring skiing, I thought I would document my eats. What a great excuse for me to take pictures of my food. (Which is kind of an obsession for me.) So…if this isn’t your gig, I understand. Come back next week. We got off to a rather late start Friday (hubby said he would be home by 5, hubby actually got home close to 7:30). I had been super excited for dinner at Whole Foods in Milwaukee, but given the lateness of the hour, we nixed that plan. Pretty sure the hot bar would be closed. Plus, it’s a bit of the beaten path, and we were looking for quick and easy. A Starbucks was conveniently located next door, so we stopped in and loaded up on caffeine. A soy latte for me, a soy chai for the hubby. And the barista promise is true, as she remade mine after failing to use soy milk the first time around. I have to tell you, the caffeine worked. We drove until midnight (or 1 am, depending on what time zone you’re in), and I didn’t experience the typical “eyelids sticking to eyeballs” sensation I usually experience. We spent the evening in South Bend. My husband was wearing one of his Binghamton University sweatshirts, which served as a great conversation starter for a lady waiting for her java. Turns out she was familiar with the Bing. Plus, she graduated from UW-Milwaukee and still had relatives living in the area. We talked briefly about her love of the Pack, the Badgers, and the Brewers. When she discovered I was a teacher (a Wisconsin teacher), she offered her condolences. She was also a teacher. And now, if you’ll excuse me, I need to…rant. Know what drives me insane? No? Tough, I’m going to tell you anyway. Let’s say you are at Chipotle when it’s really busy. I’m talking at least 2 dozen people waiting in line to order. Plus, the dining area is full. The only spots available are the little buffer zones between groups sitting at the long tables. Anyway, let’s just say that you snag a spot to sit in the middle of two groups (still maintaining a buffer, but sitting next to a purse)…only one of the groups is just one person with 2 purses sitting on chairs across from and next to this said person. As I sit, single person looks frantically at group of women standing AT THE BACK OF THE LINE. I put that in caps, ‘cuz I wanted to emphasize this a bit. Rest assured I am not yelling at you. Once one of the women in line makes eye contact with frantic looking woman sitting at table, she quickly hurries herself over and places her purse next to me. Meanwhile, there are two parties who have received their food and have no place to sit. Anyway, we actually finished our meal before the said group even made it to the cashier. Rant done. Thanks for listening. Or I guess thanks for reading would be more accurate. Had a little mid-afternoon snack at a gas station. Slim pickin’s my friends, slim pickin’s. Kind bars are a good choice for me…I just watch the amount of sugar in them…5 grams or less is pretty good. I also had a bottle of water which I drank s-l-o-w-l-y…I have this fear of desperately having to go to the bathroom when driving. After driving through snow (yes, snow…even had to change out of my sandals in an effort to avoid looking like a complete idiot), we finally rolled into the Bing at 5:00 ish. We quickly checked into our hotel, and headed over to campus. We had made plans with the girls to eat at Alli’s restaurant of choice…Crepe Heaven. 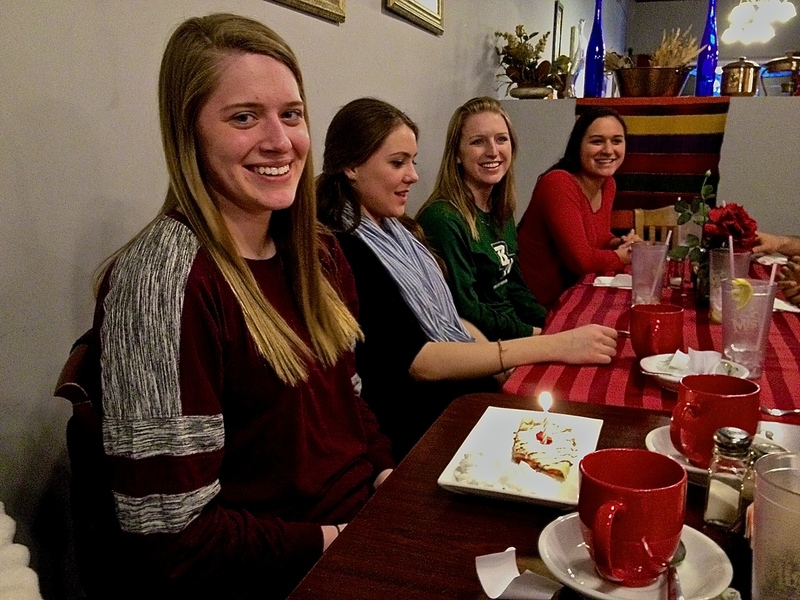 This was her birthday dinner, as she celebrated the big 2-0 on St. Patrick’s Day. She invite her suitemates/teammates along, and Kristin brought one of her good friends along. I ordered a veggie plate, but that’s not quite what I was served. The owner has a rather thick Greek accent, and I had misunderstood what she said, but I made do. Sorry…forgot the picture. You can see my cup of chamomile tea though! Alli was served a Happy Birthday crepe…strawberries and nutella…her fave! After supper we dropped the girls off, before heading to the grocery store to stock up on fruit, wine, and dark chocolate. My supper did not tide me over, so I had grapes and chocolate when we got back to the hotel. I was so hungry, I forgot to stop to capture the moment. The next morning, we worked out in the rather impressive looking exercise room at the hotel, and then picked the girls up for breakfast. We dined at a place called Nezüntoz (knees and toes) Cafe. Love the name. Loved my sammy too-A Jack and Straw panini…mushrooms and onions sautéed in garlic olive oil on multigrain bread. Plus a soy latte…’cuz I’m on vacation. Then we headed up to Syracuse to go to the mall. We had a great day…I absolutely love hanging out with my kids! They turned out awesome despite our parenting. We had a late lunch at a Mexican restaurant at the mall. I can’t remember the name, but the salsas were to die for, as was the guacamole they make table side. 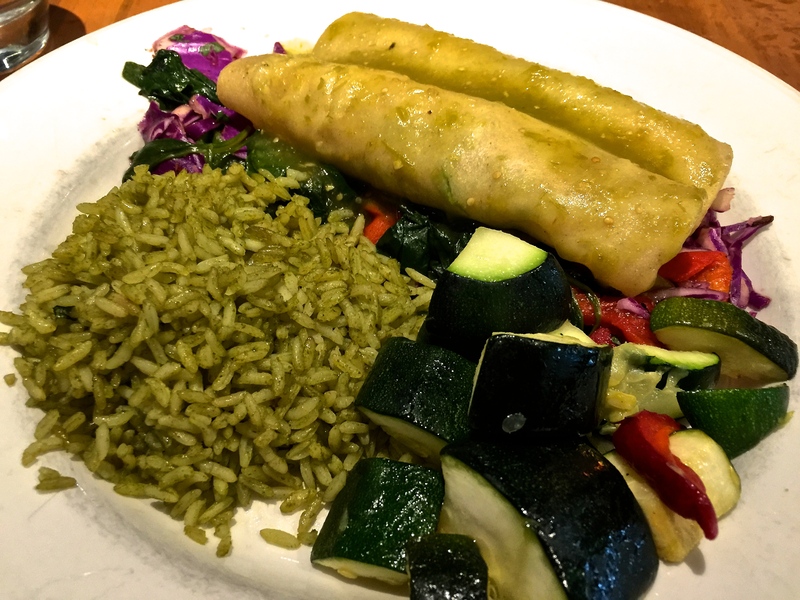 I had spinach and artichoke enchiladas in a spicy green tomatillo sauce! Delicious! On our way back to Binghamton we stopped at Strong Hearts Cafe. I made this discovery a few years ago, and we stop every time we are in Syracuse. I dream about this place…and I am sad that we don’t have anything remotely like Strong Hearts near us. All vegan! I get pretty excited about vegan desserts that I don’t have to make. Perhaps that’s why I ordered a cookie AND a shake. This little “snack” served as supper. And no judging…I’m on vacation. This cookie was the size of my head. And I ate it ALL. 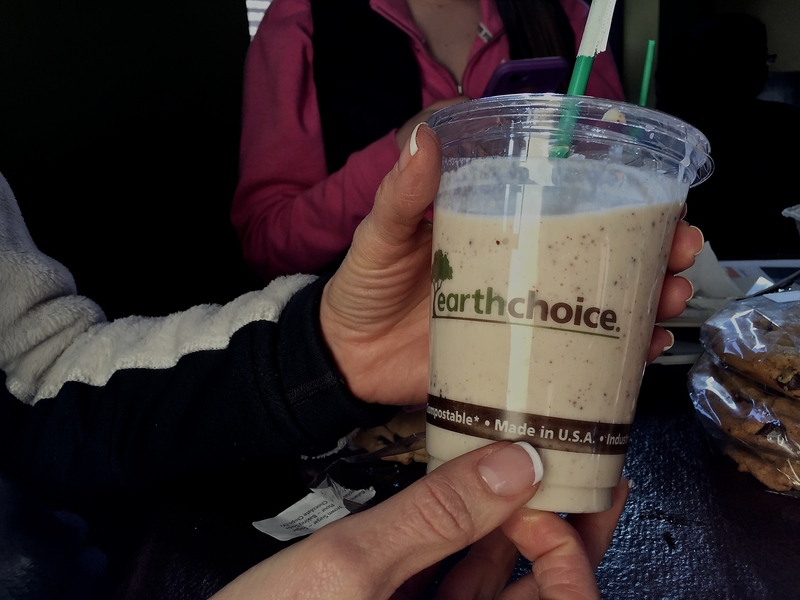 Nothing wrong with this Farm Sanctuary shake either! We ran a few errands with the girls, and then dropped them off at their respective dorm and apartment. That’s the hard part for me…I hate saying goodbye!!! You’d think it would get easier, but it doesn’t. But, on the bright side, we are off to Killington for some spring skiing tomorrow!